Reply is the leading sales acceleration platform that automates one-to-many communication scaling outreach capability, while keeping it 100%. 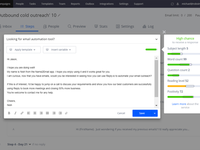 Reply enables scaling sales with no extra hiring needed by automating personalized cold emails and follow-ups. 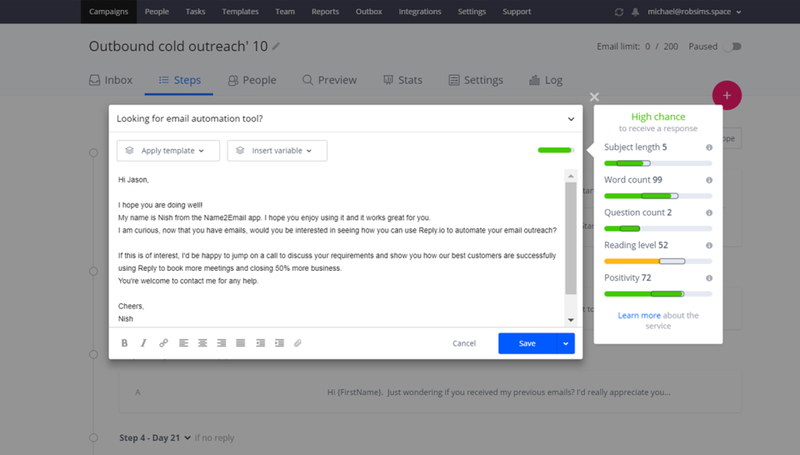 Whether its inbound leads, outbound prospects, user trials or customers - Reply puts your outreach on autopilot, while still keeping each communication personal. Made my outreach a walk in the park! Cons: It's hard to organise lists, and list management is a bit strange. Pricing is high per number of contacts, although it didn't bother me as we sent it to smaller lists. Overall: I came in contact with Reply as I was looking for a tool to streamline and optimise my sales outreach. We don't do mass cold mailing, rather research each lead and personalise the emails. And we personalise the follow-ups if they don't respond right away. We personalise them using a template, so we can do mail merge when we send emails (a bit more complex than usual, but it still works). The ideal tool would have the options of a simple CRM, with personalisation lines, a way to send emails and to automate follow-up emails. The reason we chose Reply, and why I'm quite happy with it, because it has all of the features I required + multi-variate testing and most importantly, a great way to do reporting (I love they have a way to qualify the leads as well based on their responses, quite good when you're analysing the results). Customer support is quite responsive and they were quite interested in discussing some probable new features, which I quite like. The pricing is a bit high for a low amount of emails, but as we focus more on qualifying the cold leads, it wasn't an issue on my end. For mass mailers on huge lists, it may be. But again, this isn't a tool for spammers, rather for those that want to do smart outreach. To put some proof in it, we had a 55% average open rate for our cold emails, and a 40% reply rate. Which is quite high for cold campaigns. Want to 10x your sales efforts? Use this app! Simple to use. Easy to build campaigns and add contacts to them. Very helpful for sending targeted messaging to prospects. It just works. Emails look slick and they're completely personalized. Zapier integrations work really well. 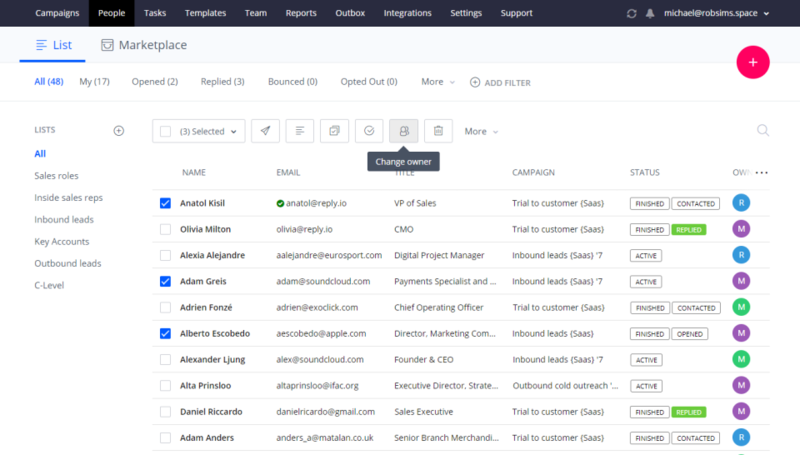 For example, you can set a Zap to stop sending emails to a prospect when they 'close' in your CRM, ensuring there is no overlap in communication. Cons: Just some design/aesthetic things that could use improvement. For example, the ability to archive campaigns or collapse folders. However, they are working on design improvements. The design improvements have no impact on app functionality, it works incredibly well. Overall: We started using Reply a few weeks ago and the ROI is obvious. $70 for 1000 contacts and we DOUBLED our monthly sales. The app is fairly intuitive and can be learned quickly. The support team is really responsive for any questions that do arise. It's been an awesome experience so far and we're looking forward to buying more contacts as our sales team scales. However, we haven't had the need to scale yet because Reply allows each member of the team to 10x their efforts! Cons: Reply can be difficult to get started with. Especially when compared with other sending softwares, the number of features can be overwhelming. I would recommend Reply for anyone who really wants to dive into the world of email marketing, but for newcomers, I would suggest other options. Cons: Very little dislikes at all. Maybe some small tweak to the UX or some reports I only look at infrequently....but definitely nothing material. Pros: - because there is not a lot of HTML involved in the formatting of the email, the letters get directly into the inbox (unlike Promotions or Spam), which is the main benefit of this emailing instrument. 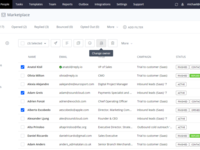 - it's convenient to create email chains and track notifications and responses. - there are team plans for collaboration and you can see the activity of your colleagues, which helps a lot when you need to create statistics for the marketing department. Cons: - the absence of the HTML formatting is both a blessing and a curse. It is hard to highlight things in the email sometimes, but it pays off well. Overall: We use Reply.io for following up our website leads. We have tried several instruments (SendGrid, MailChimp, HubSpot emails) before switching to Reply.io and so far it was the best instrument. Our response rate has increased by almost 10% due to Reply.io. Cons: They don't support html for "format" intensive marketing email....pretty much the only thing I'd like to be able to do with Reply that I cannot at the moment. Overall: This product fits all of my requirements. I've tried many of their competitors and have yet to find an app as well rounded and that has a good UI like Reply. Reply has a huge functionality for its money but also number of bugs. Pros: Huge functionality is definitely a plus. You could configure emails at any stage and compare to any companies in a market they offer a lot more for the same value. Also, they have the best support I have ever experienced in SaaS. I wrote to them at 8 am and 10 pm and always reply time was less than 3 minutes, and information that they provided was sufficient. Cons: Bugs, server outages, website slowness. Reply team add a huge amount of new functions to their app, but they don't test it properly sometimes that creates a number of bugs. Pros: The ability to assume any team members' account to create drips, add people to current campaigns, and view statistics without the need for that member to log in. Second, the platform's ability to recognize when a person is already part of a drip and blocking duplicate sends is great! Third, the Zapier intergrations make using Reply automated and even more valuable. Cons: Lack of full campaign sharing between team members. Right now we are able to share individual email templates into team/public shared categories. That then requires each team member to build a campaign from scratch, even if its the exact same as another team member. The crm is a bit lacking in filtering capabilities and segmentation. The most visible filtering option is to filter by upload file name, which is cool, but being able to categorize and group people by custom fields that we create within the platform would be much more valuable and useful. Overall: We've been looking for a way to improve our pipeline development and needed an automated email platform to help us develop our SDR (Sales Development Resource) strategy. We have a small team of sales representatives and they focus primarily on building and deepening existing relationships, as well as closing open deals. So new relationships are hard for them to create. Reply has allowed us to keep our team the same size, and build an SDR role, that uses Reply to start new relationships for our sales representatives. Its been an improvement in pipeline without increasing overhead. Hi Daniel, thanks for the review! Pros: Everything is awesome. I especially love their customer support and client success divisions. Great people, always willing to help when we need. Learning curve is perfect! Cons: Some minor features are still missing, but I'm a very demanding client. For example everytime you upload contacts and some of the contacts are skipped, the app should notify why. Overall: I started using Reply around 4 months ago to manage cold sales emails. It is the main tool I use not only to monitor the whole activity but also to improve our process. The statistics interface is so simple yet so rich in information, that we can easily look at it and understand the bottlenecks of our process and what we need to improve. Moreover it is very easy to use, with a very intuitive interface and a very nice flow. In the rare occasions when I was in trouble using it, the people behind live chat support didn't take more than 10 minutes to answer my questions! Customer support and client success divisions are not worried if you renew your subscription or not, they just want you to succeed, and help you do that! Recommendations to other buyers: Take the free trial and you will understand that this is a great product, the best value for money! Reply is one the best tools for marketing I've ever used. Cons: It can be buggy at times but customer service to great to help with this. Don't really have any other cons as the customization is amazing and haven't found anything I need that it can't do. Pros: I've generated a lot of business using this application. It's kind of my software MVP. I've also really enjoyed the customer service - the team here is responsive, kind/patient, and knowledgeable. Cons: No cons at this time. I might like it if I did not have a limit on how many emails I can send, but that would cost a bit more, so that's more an issue with my own budget than the system - this thing has paid for itself multiple times over., so I really should just allocate more money towards it to increase my limit. Overall: - Personal messages to leads. Pros: The service and the way it works is very good. Support is always lightning fast and very helpful. Maybe the best support I have ever experienced. Cons: A slightly better user experience and tool tip will make the experience much better. Sometimes it is not very clear how exactly things work. But this has significantly improved recently. Comments: Since I just started replyapp.io just a few days ago, I cannot evaluate results from its automated marketing program, although my first test worked great. This review is about their top notch customer service, of which I was in need during my test set-up. During the set-up of my first campaign, I was unable to open the log-in page after signing in. I was in desperate need for help, since I wanted to get my campaign started right away. After having most of a Friday with no accessibility to the website and no solution, I got in touch directly with the owner, Oleg, who responded immediately. After sending him the source code for the unresponsive web page, he replied with an answer and solution by very early Saturday morning. Although he stated that it would probably be Monday before he might have a solution due to the upcoming weekend, I woke up the next day with an email from Oleg stating that his developer found the error and source of my problem. I was able to access the website right away. After being a brand new customer for just over a day into my free trial period, I felt like Oleg and his team made me feel like their most important customer. Not every company does this, and I commend replyapp.io for doing so. I will recommend replyapp.io to anyone and look forward to using their system in my recruiting efforts. I couldn't do my job without it! Pros: I like how easy it is to use for all my email campaigns. It works great for both cold-email prospecting campaigns and for post-call follow-up reminders. It provides me with a constant flow of leads and produces real results for our sales team. I use the metrics to focus on prospects who are engaging with my emails. I also use the tasks to convert more leads. Cons: Better duplicate name recognition because I sometimes add prospects twice. Everything else is great! Very strong dashboard and friendly user interface. Cons: Only import excel csv . At times page takes a while to refresh I.e cant display all imported names at one go. Overall: Was easy to adopt this tool and the dashboard was powerful to track and monitor campaigns. With the correct template and steps both open rate and reply rate are high. The Best Product and Service Provider I've worked with PERIOD!!! Pros: It does exactly what I need. Help me get in front of people, consistently. Cons: I don't have anything negative I could say about their product or service. Overall: Exceptional. Their support is the best of any company I've worked with. They really are a partner for my small business. Super easy to use and helpful! Pros: Easy set up. Drip. Analytics. Integrations through Zapier with Hubspot. Gmail integration is nice too. Simplicity makes it easy to set everything up quickly. Cons: Sometimes a little buggy loading screens but overall hard to beat. Pros: It's one of the best and easiest tools I've seen/used for follow-up emails that END UP IN THE INBOX (not in Spam, Promotions, or elsewhere) :) Besides the fact that it qualifies as actual email, the usability is on the highest level and therefore it's a very convenient product to use. Cons: The emails don't allow many formatting options, but if that means that the email goes to my client's or lead's Inbox, I'm okay with plain text emails. Overall: It helps us (both Marketing and Sales departments) to reach our goals and communicate with hot leads who leave a message on our website that they'd like to be contacted by us. Since there are too many leads at times, we can't leave some behind, but personal emails to each one take too much time. Therefore, Reply saves us. Pros: The best thing about Reply is its detailed analytics that enables you to exactly know what happens to your emails. It can track delivery, open, click, and reply rates. Cons: I haven't experienced any con so far. Overall: I have a wonderful experience with Reply. With this application, I'm able to put my outreach on autopilot. It is an easy-to- use application, and you don't have to be a tech geek to use it optimally. The templates are easy to set up and get running. The customer service is immediate. Pros: It works. It allows me to focus on more prospecting and biz development instead of spending all my time trying to reach people. Set it and forget it. Cons: I wish the open stats somehow merged with my Zoho CRM. I'd love to have everything in one place. More integrations would be nice. Overall: Allows me to get a hold of the people who are hard to get a hold of. Awesome experience! Customer support is top notch and the platform helps in contacting prospects. Pros: I like knowing how many times emails have been viewed and the ease of moving high "viewed" contacts into focused campaigns. Overall: streamlined process of engaging prospects! Overall: There are few startups that i've met that actually LISTENED to my feedback..and implemented it. This is one of them. Their app is essential to our growth and it has been performing incredibly well. They've really thought it through nicely. And now with their latest major release the UX is astounding. Pros: In my company, we had about 2500 leads that were warm leads but failed to covert. We used Reply.io to email them personally and pull them into a sales call. The open rate/reply rate was incredible. Reply.io made it super easy to email these warm leads as if it was a direct email. Cons: Because I had a very specific timing for this reactivation campaign, I had to a lot of math/grouping prior to importing them into reply.io. Reply.io is a very clean-looking and slick system. But I was still having trouble figuring things out. Overall: The ability to mass-send emails as if they were custom emails is fantastic. I recommend this to all my clients. Pros: Easy to use and lots of functionality. Do not have any complaints and I would recommend it to other businesses. Very simple and incredibly powerful. Pros: The time it would have taken to manually send those emails, monitor responses and quickly engage with customers would have been unrealistic (if possible at all). The customer support is absolutely outstanding. Cons: There were times when the onboarding or prompting could have been better. If an upload of data failed it didn't say for what reason (e.g data wasn't what it expected in certain rows). So this required a little trial and error to get sorted but again, customer support stepped in to help out. Once that was sorted, smooth sailing. Overall: Quick feedback from leads. Time saving. Cost saving. Highly recommend for mass (yet targeted) email. Pros: Easy to use and extremely effective. Their integration with custom SMTP servers and GMAIL accounts were critical for us - and it works flawlessly. Cons: It can be a tad slow to load sometimes. But hey - that's probably because they are becoming so popular! I'd say the price is expensive but it's very competitive with other software and easily pays for itself 5x over. Overall: Reply has been a critical component of our marketing outreach campaigns. It's extremely easy to use, effective and had all the features that we desired. We previously looked at several other tools and kept coming back to Reply. It's now been about 6 months since we first signed up and will continue to be customers for a very, very long time. Reply was the best investment that we made at NeoAssist, in our Outbound Marketing process! Pros: It is very easy to use, and you can get started with an email campaign in minutes. You don't need to spend a huge amount of time learning the software if you have some email marketing experience. Cons: The daily reports sent to me. But having said that, I am not sure if I set them up correctly - the reports didn't include the names of the campaigns so were pretty useless to me. Overall: It made cold emailing easier for me because all I needed to do was set up my templates and set up the campaign (which took minutes because I had already written the email copy), and it ran by itself. The software also provides templates so you don't even need to be a copywriter! Pros: Every email you send is personalized. Every campaign you create has analytics data you can use to improve the campaign. Emails are sent automatically and camapigns don't require any manual actions up until you get a reply. Connecting to some 3rd pary mail servers is more complicated than it should be, but it's not an issue. Overall: Insane open-rates, insane response-rates. It turned email outreach into a valid leadgen channel, which I didn't expect. Great for reaching our to LinkedIn contacts! Pros: It allows me to mass send normal looking emails to my network and keep them updated about my latest research in a personal way. Best of all it's super fast to use, tracks replies, and allows me to split test various notes. Cons: It only works with IMAP emails (not POP), so I had to upgrade my email service. Overall: I was looking for a way to leverage my extensive LinkedIn network when I found the Reply App! I exported my LinkedIn contacts and imported them into Reply (a very simple process). I now have an email drip campaign going out, that looks like a personalized email to an individual. Brilliant! Recommendations to other buyers: It's great software if you want to mass email a list. That's all it does, and it does it very well. Blows Competition Out of the Water! Comments: From my initial sign-up, my experience with Reply has been nothing but excellent. Instantly I was able to explore the product - it was both intuitive and feature-packed. By comparison, it took me almost a week to get a demo of what I think are the closest rivals - Sendbloom/Outreach IO/Persist IQ. Persist IQ never even got back to me about scheduling a demo, Outreach IO turned out to be prohibitively expensive for a small startup like mine, and I couldn't explore any of these products without scheduling a demo first. The entire process was really frustrating - exacerbated by the fact I was on a different timezone to their support teams. When I finally got a demo, I found competitors did not match up to Reply (in particular, Reply has an API which is an absolute must-have as I intend on using this for inbound as well as outbound emails). Overall an excellent product with outstanding customer service - the team has been prompt and helpful with their replies and I look forward to working with them for a very long time. Pros: The ability to know that the email has been viewed, how many times it has been viewed is simply awesome. Great feature set. Cons: Some minor glitches may be annoying but could be avoided when getting used to. No issues other than that. Pros: Great team, very responsive. The system itself also saves a ton of time! Definitely recommend this to anyone. Cons: Sometimes difficult to manage duplicate leads across multiple user accounts. Very easy if you only have one account. Pros: I recommend it to my startup friends, and literally go out of my way when I hear them complaining about following up and people not responding. Overall: I am a bootstrapped startup with limited resources. I couldn't keep up or remember everyone I was reaching out to. I researched different products but this one seemed seamless. People got back right away and the support is great via a chatbox. It literally is worth a whole sales person. I tried having a sales person do this and they couldn't even follow up the way replayapp can. It saves hours, its a must for startups and communication. And, they are actively adding features, to make it easier. The pricing is on point also. Recommendations to other buyers: Seriously, its a game changer! When properly understood and utilized this is a very powerful software marketing solution. Pros: I like the ability to have a wide degree of flexibility in customizing our email campaigns. I really like that I don't have to stay on top of the campaigns being run, and that I can automate their schedules. Cons: It takes time to learn how to do things properly as there can be glitches. Once you are aware of them you can work around pretty easily, but finding out can be a bit painful if you are not meticulous in checking your campaigns before they go out. Overall: Automation, increased productivity, and greater visibility in the customer engagement process. Reply is so GOOD I don't want to say anymore! Pros: I wish I had discovered this tool sooner. The trial, sales calls, tech support all fantastic. Automated email process and learning is fantastic. Overall: New clients in weeks. Pros: Their service is very easy to use. UI is friendly, plus they prepare a lot of templates which make it even easier to start if you are not experienced with the cold emails, yet. The staff is very friendly and helpful, ready to assist, consult on progress and suggest some optimization if that's possible. Cons: So far, I do not have any negative experience. Looking forward to be able to have more than 3 emails attached to one account. Overall: By using Reply, our start-up was able to sell $ 10,000 in 3 months time by setting up an effective Direct Mail campaign. those who believe e-mail is dead, try this tool and you will experience it by yourself. The most important factor is the quality of your e-mail database and your lead generation . Once you established a strong database of potential prospects, the Reply software let's you track individually each prospect. The tool is powerful because it allows you to send a personalized e-mail. For those who have doubts, just try the Trial version and you will be surprised. Pros: If you know what you are doing and understand how to use this tool properly it can bring huge success to your business. It is one of the most effective ways that we attract new business into our company. Cons: The software could have a little more customisation when moving the contact from one campaign to another. But this is a minor issue and is not something I think about too much as I'm able to do this manually. Pros: Been using this tool for outreach for the last 8 months and the results have been amazing. Admin + Users can send emails and customise the templates. Easy to understand UI and simple reporting plus powerful BI gives this tool and edge over the competitors. Cons: A user can send only 400 emails a day. That's actually good in a way as well. Saved my life when I lost my job. Pros: I love the ease of use and the UX. I can set up a workflow once and then constantly feed it new contacts which brings me new business every week. Fantastic. Cons: I dislike that it doesn't have error messages when you're trying to import contacts and something goes wrong. Overall: I booked many new customers during my first 30 days working for myself. 100% worth it. Excellent customer service, easy to use interface. Pros: What i like the most about this software is.....Extremely easy to use/the statistics you receive from each campaign. Very helpful. Cons: What i dislike most about this software.......One con. Reply.io freezes after too much use. Whole website doesn't load and this can be very frustrating. Comments: We've been using Reply for months now and the results were great. We've been able to reach 50% reply rate throughout most of our campaigns. Our initial email is generating 15% replies, while all the rest is gained due to automatic follow ups with this sales automation. Usually we use about 3-4 follow ups to achieve this rate. Pros: easily customizable email copies, ability to clone existing campaigns without repeatable data entry, it's also nice that everything is coming via our own mailbox. They are also very receptive to any suggestions we have to improve the product. Cons: there were some things we didn't like that much in the old version, but the new one is quite enjoyable. Cons: The platform is buggy and not necessarily easy to use. Pros: If it performed as advertised, that would be valuable. -Does not allow automated emails to people who open vs. don't open emails. Overall: We purchased this software to save time sending and replying to emails--specifically, so we could reply to emails using pre-saved templates. After purchasing the software, I learned that it doesn't actually perform that function. They won't give us our money back, so we're locked into a year contract with a service we never use. I've been creating and sending email campaigns on behalf of a number of nonprofit organizations for the past ten years, using different software, including Vertical Response, Salsa, Mailchimp, etc. I found all those easier to learn and set up than Reply. We currently have a free account with Vertical Response that allows us to send 10k emails/month. For free. With customer support from a real person, by phone, whenever I have a question. We've ended up using our free account to send emails instead of our paid account with Reply just because Reply is so unreliable and difficult to use. A huge waste of money. Pros: Very easy to set up campaigns and steps, as well as preview emails before sending. Cons: Workflow requires clicking through several parts of the site, I'd like to get everything done on the campaigns page. Overall: ReplyApp is a great tool for automating emails and follow ups. It's great to see the open rate of your emails as well. There are some features that require more steps than I'd like- for example pushing contacts to campaigns, rather than adding contacts on the campaign page. Customer service team is great and very helpful in understanding how to use ReplyApp. Recommendations to other buyers: When adding contacts not all of them will appear if there are more than a certain amount- can't wait for ReplyApp to have an endless scroll for that instead of clicking through pages to add contacts from a large list. Comments: Before trying Reply we have evaluated other most popular tools for automation outbound sales. Since we have our own email server for sending, only Reply was able to work with it, while other vendors were only telling us that they do not support custom email servers. All in all, my experience with both software and company is very positive. We have a team of five using Reply at our company and it helps us set up 8-10 appointment per sales rep per week. Up to date, our outbound process is fully done with Reply and it accounts for 10% of our monthly revenue growth, adding on average 5K in MRR per month. So, the number speaks for itself.